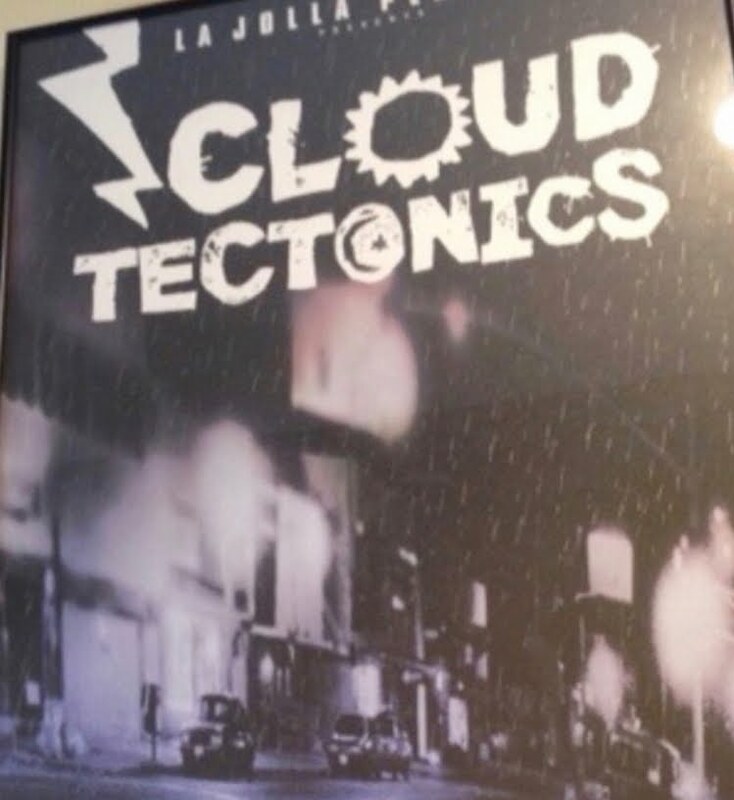 Carol's Theatre Reviews ~ It's Fun To Go Out: “Cloud Tectonics” At New Village Arts Still Mesmerizes. “Cloud Tectonics” At New Village Arts Still Mesmerizes. 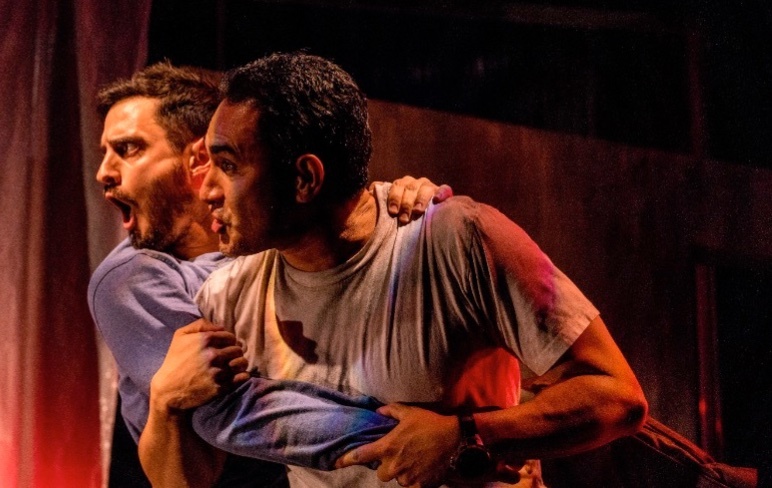 New Village Arts Theatre in Carlsbad is currently mounting José Rivera’s 1995 dream play “Cloud Tectonics” through Feb. 25th. Twenty- three years ago the La Jolla Playhouse produced “Cloud Tectonics” in the Mandell Weiss Theatre with Tina Landau directing and starred Camilla Sanes and Louis Antonio Ramo. The memory is still vivid in my mind. I found Rivera’s splay mesmerizing then. 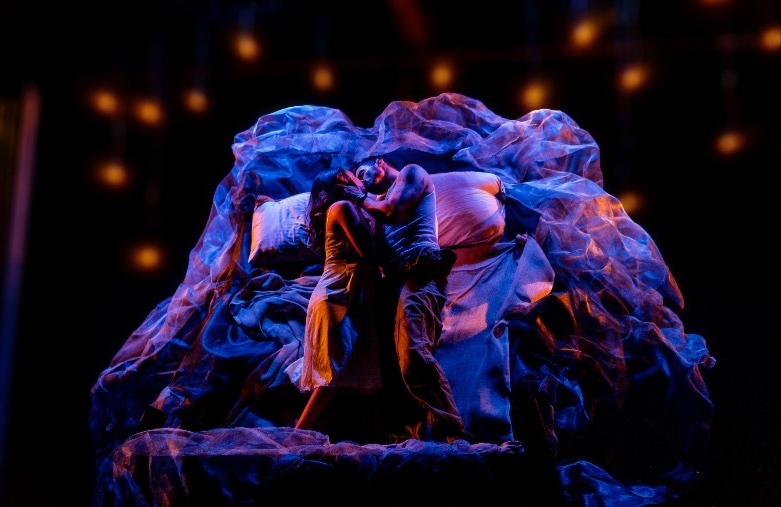 Today under the deft direction of Herbert Sigüenza with the gorgeous Nadia Guevara and equally handsome Jose Balistrieri as the two protagonists Celestina del Sol and Aníbal de la Luna, I am still in awe of the enchantment it radiates and the questions it raises. We can talk about time standing still, or of time fleeting. In any event time is something we all need more of. In the José Rivera’s “Cloud Tectonics”, time stands still for Celestina del Sol, who according to her own calculations has been pregnant for the past two years and is about 50 years old. They go through the motions of toweling off. He makes quesadilla, they engage in small talk; the baby, what it was like in her room in Montauk where there was no order, everything was on top of everything. Knowingly or unknowingly love is in the air, at least for the time Celestina and Aníbal are together. They are interrupted by the arrival of Aníbal’s brother Nelson (Javier Guerrero) just on leave from the Army wearing some weird looking ‘uniform’. The brothers, as different as night and day have not seen each other in six years. The apartment comes to life with his arrival. He’s robust, loud and doesn’t hesitate to show his feelings good or bad. He falls over heels in love with Celestina and wants her to promise she will wait for him when he returns from the war in Syria. (The original text reads Bosnia). He will take over the role as father to her long overdue baby. From the ethereal to the reality when the clock starts ticking, what emerges from the ashes of ‘The Big One’ or Armageddon – a monster with seven epicenters-releasing unimaginable waves of energy and killing many unprepared people", will blow your mind. But by plays end, nothing is as we might expect. A brave new world? Hold on to your hats. Rivera has so pretty ingteresting thoughts on how the world will transform after all is destroyed. Sigüenza has a mighty reliable cast in hand making this magical realism, this enchanting piece of theatre flow naturally. While the world outside is headed for a disaster, two lovers float through time, as it stands still, in a tiny apartment in a suburb of Los Angeles. Nadia Guevara, last seen in “The Secret Garden” has all the naïve and youthful qualities about her, yet she radiates a sexiness that attracts men to her. She plays well off of Balistrieri who is almost able to get his feet on the ground while floating through space falling in love with a mysterious woman who takes hold of his being. Surreal and mysterious from the start, the play seems to take on a life of its own as the two lovers, one named for the sun the other the moon lose each, lurch forward in another moment in time some forty years later, and find each other in a surprising turn as the hands of time have now caught with them. Set designer Christopher Scott Murillo creates a small, but functioning apartment with racks holding huge plastic bottles of water, a sofa and in an area off stage, a kitchen. After pulling back a shower like curtain, a huge bed with ladders on either side to climb takes over the entire back stage while plastic umbrellas line the sides. 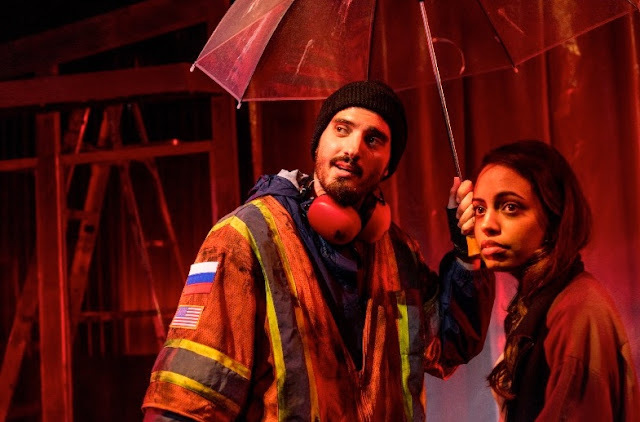 Rain and thunder can be heard throughout most of the play created by sound designer Mark Spiro who also composed the background music. Paul Canaletti, JR. makes wonderful use of the lighting, Ben Cole is fight choreographer and Carmen Amon designed the costumes. There is something fascinating about time and time travel that draws me to a play like this. What would it be like to travel through time or back in time, or to stand still in time? If that were the case what would we find, lose, or gain? What could we change, stop from happening, or live in that period, somewhat like the characters in Dana Gabaldon’s “Outlander” series. Time in a bottle, anyone?